Any community that wishes to have the experience of working creatively together on a large piece of public art can contact a lead artist. The artist visits the community to view the place where the art will be located and suggests proper materials and techniques. At this time the artist writes a first letter of agreement concerning concept, process, schedule, potential budget and terms for payment for design, teaching and fabrication services. A responsible member of the community co-signs that letter, allowing the design process to begin. The artist may ask for immediate payment of a fraction of the total agreed fee to begin the initial design work. Now the community begins to discuss with the artist the ideas they would like to incorporate in the artwork. This is an important social interaction during which the relationship of the artist as a special guest member of the community is established. After several meetings for discussion and sketching, the artist creates a few design options and presents them to the community for a vote. The lead artist must plan carefully to include work tasks that can be taught and successfully fulfilled by people who have a variety of skills. Discussions continue and final selection is made of the preferred design. The artist creates complete working drawings and presents them to the community for final review. At this time the artist writes a final letter of agreement for the selected project, including a firm budget and artist’s fee. Any departure from the budget proposed in the first letter of agreement must be negotiated. 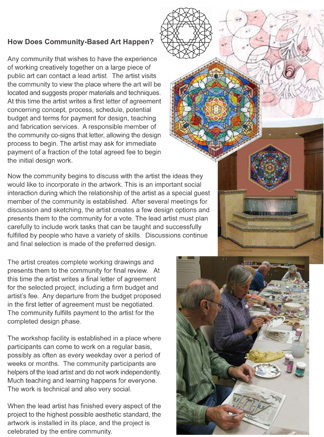 The community fulfills payment to the artist for the completed design phase. The workshop facility is established in a place where participants can come to work on a regular basis, possibly as often as every weekday over a period of weeks or months. The community participants are helpers of the lead artist and do not work independently. Much teaching and learning happens for everyone. The work is technical and also very social. When the lead artist has finished every aspect of the project to the highest possible aesthetic standard, the artwork is installed in its place, and the project is celebrated by the entire community. The process of design for a community based art project includes evolution of sketches guided by feedback from the community to the guest artist.